As posted on the Stratford Gazette, February 25, 2015. A Stratford veterinarian was honoured last month with an industry award for his ongoing contributions to helping contain and prevent the spread of the PED (Porcine Epidemic Diarrhea) virus in Canada. 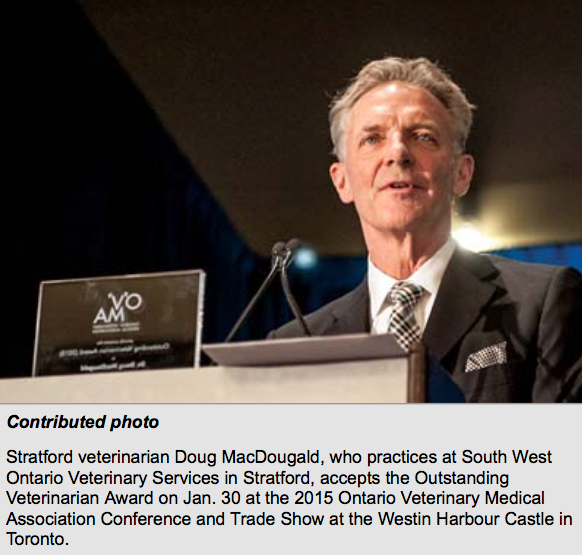 Doug MacDougald received the Outstanding Veterinarian Award on Jan. 30 during the 2015 Ontario Veterinary Medical Association Conference and Trade Show in Toronto. The PED virus does not affect food safety and poses no risk to human health, but kills close to 100 per cent of piglets that are infected. MacDougald, who practices at South West Ontario Veterinary Services, was part of an investigative team that identified biosecurity gaps in the PED crisis, conducted surveillance, and developed strategies to prevent the rapid spread that ravaged the swine population in the United States, where more than eight million piglets have been killed from the virus since 2013. Since January 2014 there have been a little more than 70 confirmed PED cases in Canada. But new confirmations are becoming less frequent. MacDougald says the declining instances of PED north of the border is a direct reflection of industry stakeholders – from swine organizations to service companies to producers to private veterinarians – coming together and working cooperatively since day one. The PED virus has been contained and many of the initial cases from last winter have now been eliminated, MacDougald adds, noting this season has seen a small number of new cases, between 10-12, crop up. As chair of the Ontario Swine Health Advisory Board, MacDougald was at the forefront of Canada’s response to the PED outbreak in the US. He says a major breakthrough came when it was discovered that the virus came into Canada through contaminated feed that originated from the US. From there, the focus turned to promoting practices that minimize the spread, particularly around transportation. MacDougald’s award not only reflects his work in the swine industry but also his humanitarian efforts. Since 2007 MacDougald has been a volunteer with the charity Sleeping Children Around the World. He’s visited developing countries in Asia or Africa every year since but one, and this April he will set off again, this time for Togo in West Africa to distribute 4,000 bed kits to poor children. MacDougald says the excursions help give him perspective, particularly last year when he went to distribute bed kits after months of intensive work around PED containment. For his contributions with Sleeping Children MacDougald received the Stratford-Perth YMCA Peace Medal in 2011.